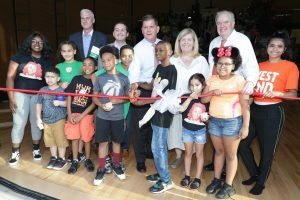 Mayor Martin J. Walsh joined local business and community leaders, families, children, and alumni to celebrate the completion of an expanded West End House Boys and Girls club in Allston, MA. Included are a substantial expansion of the teen center and the creation of a multi-purpose performing arts pavilion to showcase the work of youth participating in the club’s extensive arts programming. Over the past five years, total membership has grown by 50% and the center now provides a variety of services to more than 1,700 youth from across Boston.